There was no doubt about the standout result in Division One of the ChromaSport United Counties League last weekend. Just a few short weeks ago, Raunds Town were in pole position in the race for the second automatic promotion place behind champions-elect Pinchbeck United. But a 2-1 defeat at Olney Town set the Shopmates back and another loss last Saturday has now left things out of their hands. And few would have predicted that second loss in a row would come at rock-bottom Stewarts & Lloyds. The Foundrymen had shown signs of improvement after joint-managers Sean Mason and Derek Simmons took on the job at Occupation Road following the departure of Ian Benjamin. The 3-2 success over Raunds was just S&L’s second win of the season, both of which have been achieved since Mason and Simmons arrived. They do remain at the foot of the table but are now just one point behind Oakham United. But Mason insisted that surprise win had been coming. “We were good value for it as well,” he said. “We had a bit of a struggle because we only had 12 or 13 players available so we were scrapping around to get a few signed on and we had some lads playing out of position. “But that win had been coming. Our results hadn’t been reflective of the performances. We had been letting in some sloppy goals and it cost us. “All we can do is try to show signs of improvement. “There are games that we have been targeting and the one at Long Buckby was one of them and we should have got something from that. “Then, in the others, you are just looking to earn something. “We feel we can be competitive against anyone, we have a good group of Corby lads here now who want to do well for the club. And we proved that last weekend. The Foundrymen’s cause has been helped by the signing of Michael Byrne, who has been a prolific striker in the UCL for a number of years. Byrne scored twice in last Saturday’s win with youngster Zak Allen hitting the winner. And Mason added: “We always felt we were lacking a goalscorer and Michael has made a difference in the last couple of matches. Glyn Davies is still waiting to take charge of Desborough Town for the first time after being appointed as manager until the end of the UCL Premier Division season. Chris Bradshaw stepped down as Ar Tarn boss following the 3-0 defeat at Kirby Muxloe last weekend, which was their third loss in a row. 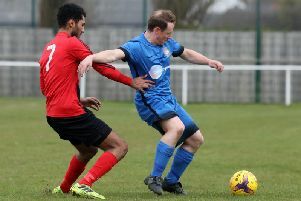 Bradshaw enjoyed a successful stint at the Waterworks Field as he led Desborough to a fourth-placed finish last season and the fourth round of the Buildbase FA Vase this campaign while they also reached the semi-finals of the UCL Knockout Cup this season and last. However, he resigned after last Saturday’s loss with Desborough revealing his resignation was only accepted “reluctantly”. In a statement, the club said: “Desborough Town FC have reluctantly accepted the resignation of Chris Bradshaw as their manager. We respect his reasons and he parts on very good terms knowing he will always be welcome him at the club. “We wish to put on record our sincere appreciation of Chris’s work at the club which led us to our highest league position for many years last season, a fine FA Vase run this season and two League Cup semi-finals. Davies, a former Ar Tarn player, had been due to take charge for the first time on Tuesday before the clash at Boston Town was postponed.